This wool won't felt and is machine washable. This wonderful natural white is supersoft, at 19.5 micron, yet also has a trick up it's sleeve: Unlike most natural fibres this particular wool won't felt. as it is Superwash treated. As such it is perfect for turning into yarns destined for clothing projects, as it means you will be able to create machine washable garments. A real babysoft wool. Superwash can still be dyed as you would with any other wool but the colours may come out a little more muted than untreated wool, but there is not much difference and of course there's no fear of accidentally felting this wool during the dye process. Works great with Landscape dyes. 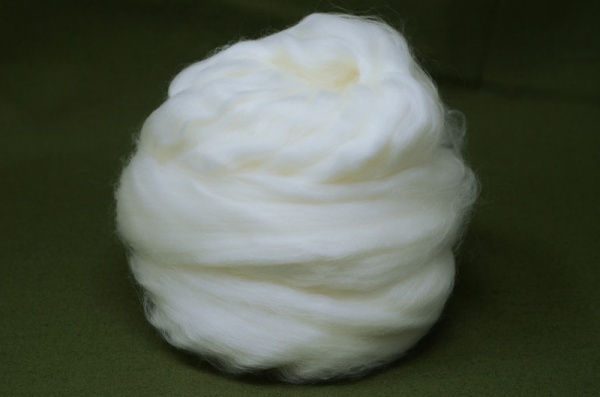 Falkland is about the whitest wool you can get without bleaching. Also because of the conditions on the Islands there is very little use of dips and insecticides so without trying they are near to organic in production. All our Falkland wools are produced from fleeces specially selected by our agent who works closely with Falkland farmers.